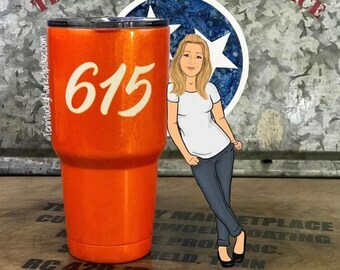 Custom Powder Coated Tumblers & More! Looking for the perfect gift? We have it! From tumblers to keep your favorite fall flavor hot and wine tumblers to keep your favorite "red" cold, you're in the right place! Check back often for new additions to our shop. Don't see what you're looking for? Want a different color? Different font? Remember custom is ALWAYS an option, just ask! 3D Honey Sign, perfect for your Rae Dunn display! Beautifully detailed. Matches your decor perfectly! 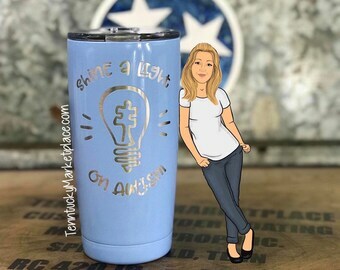 Approx 7"x6"
HUBBY OBSESSED Rose Gold Custom Powder Coated 30 oz Double Wall Stainless Steel Insulated Tumbler No Stickers or Decals!! This was my third purchase and this one is definitely my favorite. Far exceeded my expectations. We love to hear from you!! Thanks for your review!! We love when our customers send us pics!! Vacation Tumblers are a must! Custom powder coated, Rae Dunn Inspired, Tissue Box cover. Tissue Box Cover Rae Dunn Inspired BLESS YOU Custom Powder Coated Stainless Steel - NO Stickers or Decals!! Rose Gold / Seafoam - a huge favorite. Hand painting detains on this OOAK bomber tumbler. First coat of powder. Ready for design! Every color of the rainbow.....and more! I really enjoy what I do. I love to interact with my customers, it gives me a “feel” for who they are, a “face to the name” if you will. I really do pour my heart and soul into every item I make. I take great pride in my work. I’m my own worst critic. I’ve been powder coating for several years. I offer the most current items on the market working closely with my suppliers. Tim is my partner in everything. He’s always available to assist with whatever I need help with. He takes all the photos you see in my listings as well as my Instagram page. He often makes solo runs to the post office so I’m able to continue working. I love what I do! It's my goal to bring you the "perfect" product! I'm extremely particular about my work and my main objective is to bring you a product that meets or exceeds your expectations! Remember ALL items are made to order. You can easily find your shipping time within your order. Our general turn around time is 2-3 weeks. Even your tracking number will appear in your order details so you can track your package. When we process your order for shipping you will receive an email telling you that your order is on its way! We gladly offer custom designs, just ask! The nicest part of having something handcrafted is having it personalized, simply include your personalization upon check out in the “note to seller” field. Most times this is done at no charge. All of our items are custom powder coated. Please DO NOT place them in the dishwasher, the extreme heat will surely ruin the finish. Lids are dishwasher safe and I highly recommend taking the rubber gasket off from time to time to thoroughly clean. ALL of our custom tumblers INCLUDE a stainless steel straw and silicone soft tip. The soft tips come in a variety of colors, we will include what we feel is a good match. We offer discounts on bulk orders. Message us first so we can furnish you with a coupon code or have us set up a custom listing just for you. My answer to this question is always “every color of the rainbow, and more!” There are literally thousands of colors available, the combinations are endless. If you have something in mind, send it to me. Most likely I can match it. I also remind everyone that the color you see on the computer and what you see in “real life” can be very different. We try our best to show the what we feel is a good example.